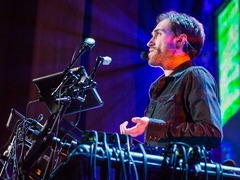 Beardyman shows off his live-production contraption at TED 2013. Beardyman: The polyphonic me What is possible with the human voice? Beardyman asks in today’s talk. He demonstrates with at least fifty manipulations of his voice – from a dog barking to the two-tone singing of a monk. “I was always trying to extend my repertoire of noises to be the very maximum it can be,” he says. On his quest to know all sounds, he ran into a physical wall: the limitations of his body. So, with the help of DMG Audio and Sugar Bytes, he created a larger mouthpiece — a real-time, live production machine that would allow him to create the music as he imagined it, without constraints. With it, he is able to embody the whole of Pink Floyd using only his voice. 1. The grunt of a sea anemone. Bernie Krause, who has been recording the voices of the natural world for 45 years, shares a few gems in his TED Talk — including the sound a sea anemone makes when it swallows an underwater microphone. Some other auditory highlights include his soundscapes of Lincoln Meadow before and after selective logging, a healthy frog choir and a heartbroken beaver’s cries. 2. Cosmic rays left over from the Big Bang is “the oldest song you will hear,” says artist-technologist Honor Harger. By studying the radio waves emitted from space using special antennas, astronomers can determine the identity and location of the object in the sky. Then, using analog techniques, these transmissions can be converted into sound. In addition to the world’s oldest song, Harger features the sounds of the Sun, Jupiter and space probe Cassini moving through the rings of Saturn. 3. Noisy office spaces – a sound many are familiar with on a daily basis. This as well as other sounds affect us in four ways: physiologically, psychologically, cognitively and behaviorally, says the sound architect Julian Treasure. Office noises, such as what you might hear in an open plan office, is detrimental to productivity. He explains that this is because humans have a small bandwidth for processing auditory input. 4. Reggie Watts. There’s no sound quite like the voice of Reggie Watts. In this performance, a sort of poetry-beatbox hybrid, Reggie’s lyrics and wit creep up the ear and titillate the brain. No words can describe it; you have to hear it. 5. A carynx. John Kenny, a master trombonist and composer, opened TEDGlobal 2013 with the droning sounds of the carynx, a Celtic vertical trumpet with a boar’s head-shaped bell at the top, complete with moving tongue to create ululation. Here, an original composition for the carynx by John Kenny. 7. A 2,000-voice virtual chorus. Composer Eric Whitacre uploaded an original choral composition called “Sleep” and a video of himself conducting – the rest was up to any or every YouTube user. Each individual took a soprano, alto, tenor or bass part in the piece and sent in a video submission. Taking over 2,000 submissions, Eric and his team stitched the audio together to create a performance by the first Virtual Choir. What does it sound like? Think about the sound of the yearning for human connection. 8. Wang Li’s mouth harp. Wang Li entranced the TEDGlobal 2013 attendees with a musical piece performed with a kouxiang, or mouth harp. The sound was electric and hypnotizing. But that wasn’t the only unique instrument he played on stage: he also played the calabash flute. Here, a sample of Wang Li’s mouth harp mastery from the Norwegian Jew Harp Festival in 2008. 10. A black hole. The universe has a soundtrack, says physicist Janna Levin. And in fact, black holes are actually a most promising candidate because they “can bang on space-time like mallets on a drum and have a characteristic song.” She shares an audio sample of what it would sound like to hear one black hole swallowing another and the effect is disconcerting and thrilling at once. Reblogged this on lala alia.